Consciousness from a friend mine. At the time I was a punk kid and would spend a lot of time going hanging out with other punky/goth and hippyish kids. 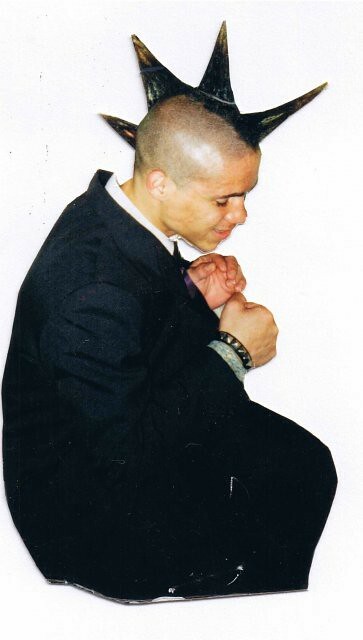 Me in 1995 prom day. It was in that crowd where I met a great friend for whom I am eternally grateful. Her name is Kalae, a young bright faced half Hawaiian beach loving girl. With all of our friends we used to spend the night talking about so many interesting subject matters; ghosts, aliens, government conspiracies, reincarnation, and spiritual consciousness. She always had such wonderful things to say, so much so that by her association I became vegetarian and had taken a personal vow of no intoxications since one week of hanging out with her. Since that time I have had no difficulties in maintaining those vows. She spoke often of the Bhagavad Gita, and although she was 2 years younger, perhaps 12 or maybe 13 at the time, she had so much wisdom and great personal character. She taught about the universal form of the Lord which is described in the 11th chapter of the Bhagavad Gita. To see the trees as the hairs on the Lord's body, and rivers as His veins, the sun and moon as His eyes, and mountains as His bones. And in this way I became attracted to the wisdom of the Vedas. She also explained that the soul and body are different things, that the body was simply a vehicle and the soul was the driver. That the soul in the body of a hog is not difference in quality as the soul in the body of a human. So from the there on I started following the no drugs, no meat and celibate lifestyle. On this trip I had the opportunity to see her again and thank her once more. I also had opportunity to solve what was a mystery to me. How did she know so much about Krishna and His service at the age of 12/13? She explained that not to long before we met she learned about Krishna from a taxi driver. 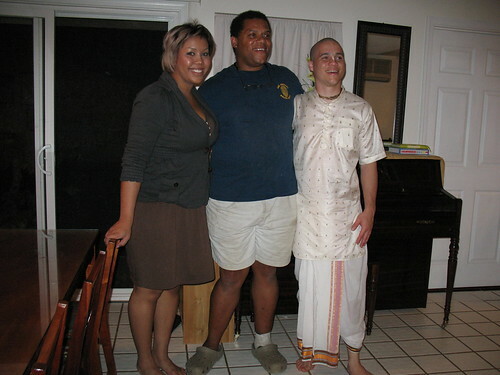 We actually had a good group of us 13 year old and 14 year old punk rockers who were interested very much in Krishna. 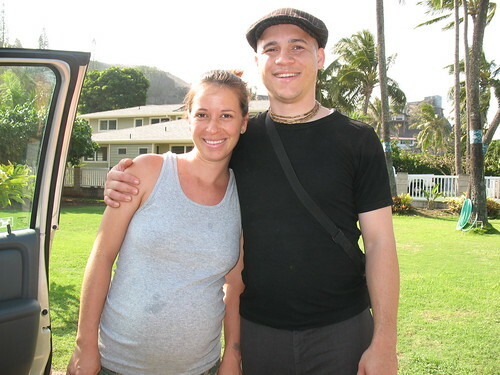 Kalae and Me, Nov 2007 She is 8 months pregnant in the photo. But it seems that the association did not just start there. 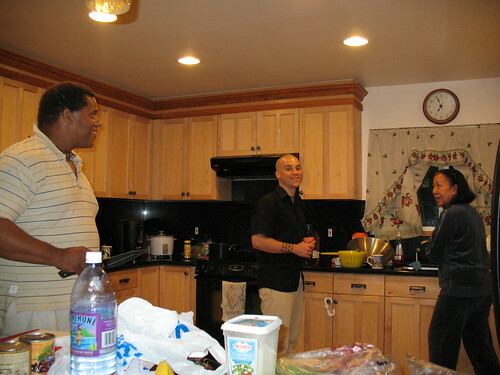 On this family trip I had a chance to spend time with my father and family from his side of the family. It had been 12 years since I had a chance to see any of them. I never really could afford a trip back to Hawaii. I had learned before of my father's previous contact with Krishna Consciousness, but not with so much detail. My father grew up in bad area of South Bronx, New York, and he always prided himself for not getting involved with gangs or drugs even though he was on his own since the age of 17. He attributed this to his interest in spirituality and personal discipline. At an early age he became interested in and studied into yoga & meditation. So much so that he started to collect a good library of eastern literature. 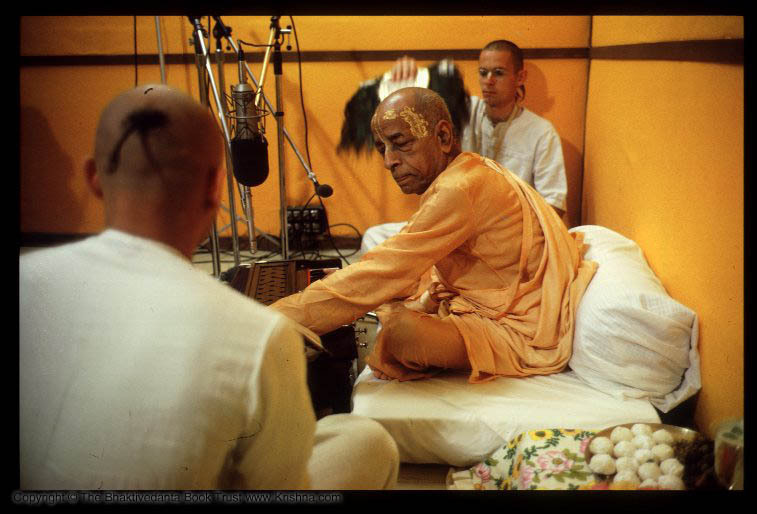 At the foreground of his collection was Srila Prabhupada's books which he quoted were his "life and soul". My Father, who had been vegetarian for 12 years, stated that it was very difficult for him to maintain his vow of vegetarianism after he joined the army in the mid 70's. When my father joined the military he brought with him a huge duffle bag of his books weighing over 100 lbs. The bag was so heavy that the strap ripped right off. He commented that those books were so important to him that there was no possibility of him leaving them behind. He also mentioned that both in Hawaii and in New York he had the opportunity to eat prasadam, food that has been offered to Krishna with love and devotion. My sister, my dad, and me. I am touched with this wonderful blog and feel that you are so fortunate to have people around you who are involved with Krishna some way or the other.